Almost 1 in 4 people over 25 years old have elevated blood glucose or are diabetic1. One in two people with diabetes remain undiagnosed2. 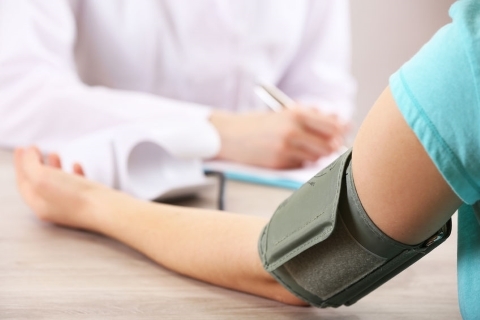 1/3 of Australians have elevated blood pressure3. Almost 2/3 of Australians are overweight3. The estimated cost of absenteeism and presenteeism caused by chronic diseases to Australian businesses is $33 billion45. Every successful health & wellbeing program starts with a thorough analysis of the issues facing your business. SMG Health has developed a range of onsite health checks options to meet the needs of your organisation and employees, based on your industry and demographics. SMG Health Checks includes a combination of blood pressure, blood glucose, total lipid profile, body composition and analysis of lifestyle factors. SMG Health has a range of additional health check modules which can be combined with any of our core assessments or offered as a standalone allowing for customised health checks based on your needs. SMG Health offers your organisation a world leading health check, specifically to identify those at risk of Type 2 Diabetes to give them both awareness and knowledge to take steps towards a healthier future. Our Diabetes screen requires no fasting and has been recognised by the WHO as diagnostic for Diabetes. Our Health Checks Plus program goes one step further by connecting your employees at high risk with a doctor within 30 minutes of their assessment to review their results and discuss appropriate medical management strategies. This enables your employees to get the best care in the most convenient and time efficient way to reduce their risk and remain healthy. We provide a direct contact and support team, not a telephone tree! We only provide highly trained, professional and friendly staff, reducing wait times and improving satisfaction levels. Trusted by nearly 400 clients including 3 of the 4 major banks and major local, state & federal government departments. State of the art security processes ensuring the physical and online data collected by your staff remains safe and secure. ISO certification, an in-house medical director, immunisation certified registered nurses and state based licenses in every Australian state and territory. Streamlined process, automated calendar invites and SMS reminders. Maximising employee participation through innovative and varied promotional options. We deliver vaccinations throughout Australia, New Zealand and the Asia Pacific Region. 1Tanamas, S.K., 2012. The Australian diabetes, obesity and lifestyle study. 2Diabetes. IDF Diabetes Atlas 7th edition. 3AIHW, "Australia's Health 2014,” Australian Government, 2014. 4PWC, 2005, Workplace wellness in Australia: Aligning action with aims; Optimising the benefits of workplace wellness. 5Medibank, KPMG Econtech, 2011, Economic Modelling of the Cost of Presenteeism in Australia: 2011.